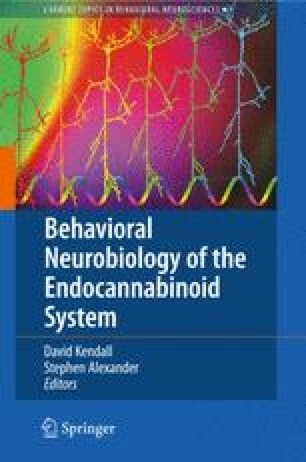 Pharmacological and biochemical investigations on the endocannabinoid system are facilitated by the availability of compounds which interact with its constituents in specific and understandable ways. This chapter describes the main representatives of several classes of chemicals employed as pharmacological tools in this field, focusing on small organic compounds having, where possible, a drug-like structure. Many compounds having different intrinsic activity and selectivity towards the G-protein coupled receptors (GPCR) CB1 and CB2 are now available and are currently employed in research protocols. Recently, allosteric ligands for CB1 receptor and selective ligands for GPR55, a newly characterised GPCR, have also been described in the literature. As for compounds affecting endocannabinoid levels in living tissues, many classes of selective and, in some cases, drug-like inhibitors of FAAH are available, while only compounds with poor selectivity or in vivo activity are known to inhibit other enzymes involved in endocannabinoid catabolism, such as NAAA or MGL, and in endocannabinoid biosynthesis.